"Property" has acquired an almost greater sacredness in our social conscience than religion: for offence against the latter there is lenience, for damage to the former no forgiveness. 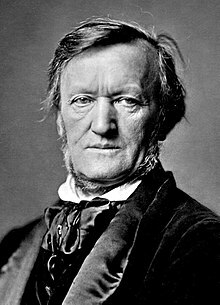 I like Wagner’s music better than any other music. It is so loud that one can talk the whole time, without people hearing what one says. ~ Oscar Wilde. 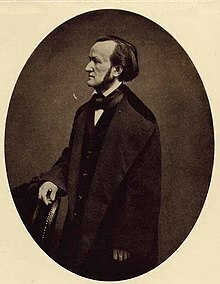 Wilhelm Richard Wagner (22 May 1813 – 13 February 1883) was an influential German composer, conductor, music theorist, and essayist, primarily known for his groundbreaking "music dramas", he led a life characterised, until his last decades, by political exile, turbulent love affairs, poverty and repeated flight from his creditors. His pugnacious personality and often outspoken views on music, politics and society made him a controversial figure. I hate this fast growing tendency to chain men to machines in big factories and deprive them of all joy in their efforts — the plan will lead to cheap men and cheap products. The oldest, truest, most beautiful organ of music, the origin to which alone our music owes its being, is the human voice. "I believe in God; and Mozart, and Beethoven as his only sons." It is necessary for us to explain the involuntary repugnance we possess for the nature and personality of the Jews … The Jews have never produced a true poet. Heinrich Heine reached the point where he duped himself into a poet, and was rewarded by his versified lies being set to music by our own composers. He was the conscience of Judaism, just as Judaism is the evil conscience of our modern civilization. The error in the art-genre of Opera consists herein: a Means of expression (Music) has been made the end, while the End of expression (the Drama) has been made a means. Recently, while I was in the street, my eye was caught by a poulterer's shop; I stared unthinkingly at his piled-up wares, neatly and appetizingly laid out, when I became aware of a man at the side busily plucking a hen, while another man was just putting his hand in a cage, where he seized a live hen and tore its head off. The hideous scream of the animal, and the pitiful, weaker sounds of complaint that it made while being overpowered transfixed my soul with horror. Ever since then I have been unable to rid myself of this impression, although I had experienced it often before. It is dreadful to see how our lives—which, on the whole, remain addicted to pleasure—rest upon such a bottomless pit of the cruellest misery! This has been so self-evident to me from the very beginning, and has become even more central to my thinking as my sensibility has increased … I have observed the way in which I am drawn in the [direction of empathy for misery] with a force that inspires me with sympathy, and that everything touches me deeply only insofar as it arouses fellow-feeling in me, i.e. fellow-suffering. I see in this fellow-suffering the most salient feature of my moral being, and presumably it is this that is the well-spring of my art. The July Revolution took place; with one bound I became a revolutionist, and acquired the conviction that every decently active being ought to occupy himself with politics exclusively. I fixed my mind upon some theatre of first rank, that would some day produce it, and troubled myself but little as to where and when that theatre would be found. I had translated the first twelve books of the Odyssey. For a while I learnt English also, merely so as to gain an accurate knowledge of Shakespeare; and I made a metrical translation of Romeo's monologue. Though I soon left English on one side, yet Shakespeare remained my exemplar, and I projected a great tragedy which was almost nothing but a medley of Hamlet and King Lear. The plan was gigantic in the extreme; two- and-forty human beings died in the course of this piece, and I saw myself compelled, in its working-out, to call the greater number back as ghosts, since otherwise I should have been short of characters for my last Acts. This play occupied my leisure for two whole years. The July Revolution took place; with one bound I became a revolutionist, and acquired the conviction that every decently active being ought to occupy himself with politics exclusively. I was only happy in the company of political writers, and I commenced an Overture upon a political theme. Thus was I minded, when I left school and went to the university: not, indeed, to devote myself to studying for any profession — for my musical career was now resolved on — but to attend lectures on philosophy and aesthetics. By this opportunity of improving my mind I profited as good as nothing, but gave myself up to all the excesses of student life; and that with such reckless levity, that they very soon revolted me. Germany appeared in my eyes a very tiny portion of the earth. I had emerged from abstract Mysticism, and I learnt a love for Matter. Beauty of material and brilliancy of wit were lordly things to me: as regards my beloved music, I found them both among the Frenchmen and Italians. I forswore my model, Beethoven; his last Symphony I deemed the keystone of a whole great epoch of art, beyond whose limits no man could hope to press, and within which no man could attain to independence. The utter childishness of our provincial public's verdict upon any art-manifestation that may chance to make its first appearance in their own theatre — for they are only accustomed to witness performances of works already judged and accredited by the greater world outside — brought me to the decision, at no price to produce for the first time a largish work at a minor theatre. When, therefore, I felt again the instinctive need of undertaking a major work, I renounced all idea of obtaining a speedy representation of it in my immediate neighbourhood: I fixed my mind upon some theatre of first rank, that would some day produce it, and troubled myself but little as to where and when that theatre would be found. Though physiologists are still divided as to whether Man was meant by Nature to feed exclusively on fruits, or also upon flesh-meat, from its first faint glimmerings History shews Man's constant progress as a beast of prey. As such he conquers every land, subdues the fruit-fed races, founds mighty realms by subjugating other subjugators, forms states and sets up civilisations, to enjoy his prey at rest. Attack and defence, want and war, victory and defeat, lordship and thraldom, all sealed with the seal of blood: this from henceforth is the History of Man. From of old, amid the rage of robbery and blood-lust, it came to wise men's consciousness that the human race was suffering from a malady which necessarily kept it in progressive deterioration. Many a hint from observation of the natural man, as also dim half-legendary memories, had made them guess the primal nature of this man, and that his present state is therefore a degeneration. A mystery enwrapped Pythagoras, the preacher of vegetarianism; no philosopher since him has pondered on the essence of the world, without recurring to his teaching. Silent fellowships were founded, remote from turmoil of the world, to carry out this doctrine as a sanctification from sin and misery. Among the poorest and most distant from the world appeared the Saviour, no more to teach redemption's path by precept, but example; his own flesh and blood he gave as last and highest expiation for all the sin of outpoured blood and slaughtered flesh, and offered his disciples wine and bread for each day's meal:—"Taste such alone, in memory of me." … Perhaps the one impossibility, of getting all professors to continually observe this ordinance of the Redeemer's, and abstain entirely from animal food, may be taken for the essential cause of the early decay of the Christian religion as Christian Church. But to admit that impossibility, is as much as to confess the uncontrollable downfall of the human race itself. That it must have been hunger alone, which first drove man to slay the animals and feed upon their flesh and blood; and that this compulsion was no mere consequence of his removal into colder climes … is proved by the patent fact that great nations with ample supplies of grain suffer nothing in strength or endurance even in colder regions through an almost exclusively vegetable diet, as is shewn by the eminent length of life of Russian peasants; while the Japanese, who know no other food than vegetables, are further renowned for their warlike valour and keenness of intellect. We may therefore call it quite an abnormality when hunger bred the thirst for blood … that thirst which history teaches us can never more be slaked, and fills its victims with a raging madness, not with courage. One can only account for it all by the human beast of prey having made itself monarch of the peaceful world, just as the ravening wild beast usurped dominion of the woods … And little as the savage animals have prospered, we see the sovereign human beast of prey decaying too. Owing to a nutriment against his nature, he falls sick with maladies that claim but him, attains no more his natural span of life or gentle death, but, plagued by pains and cares of body and soul unknown to any other species, he shuffles through an empty life to its ever fearful cutting short. As we began with a general outline of the effects produced by the human beast of prey upon world-History, it now may be of service to return to the attempts to counteract them and find again the "long-lost Paradise"; attempts we meet in seemingly progressive impotence as History goes on, till finally their operation passes almost wholly out of ken. Among these last attempts we find in our own day the societies of so-called Vegetarians: nevertheless from out these very unions, which seem to have aimed directly at the centre of the question of mankind's Regeneration, we hear certain prominent members complaining that their comrades for the most part practise abstinence from meat on purely personal dietetic grounds, but in nowise link their practice with the great regenerative thought which alone could make the unions powerful. Next to them we find a union with an already more practical and somewhat more extended scope, that of the Prevention of Cruelty to Animals: here again its members try to win the public's sympathy by mere utilitarian pleas, though a truly beneficial end could only be awaited from their pursuing their pity for animals to the point of an intelligent adoption of the deeper trend of Vegetarianism; founded on such a mutual understanding, an amalgamation of these two societies might gain a power by no means to be despised. It seems as if the State's disposal of the apparently so simple idea of Property had driven a beam into the body of mankind that dooms it to a lingering death of agony. Let us save and tend and brace our best of forces, to bear a noble cordial to the sleeper when he wakes, as of himself he must at last. "Property" has acquired an almost greater sacredness in our social conscience than religion: for offence against the latter there is lenience, for damage to the former no forgiveness. Since Property is deemed the base of all stability, the more's the pity that not all are owners, that in fact the greater proportion of Society comes disinherited into the world. Society is manifestly thus reduced by its own principle to such a perilous inquietude, that it is compelled to reckon all its laws for an impossible adjustment of this conflict; and protection of property — for which in its widest international sense the weaponed host is specially maintained — can truly mean no else than a defence of the possessors against the non-possessors. Many as are the earnest and sagacious brains that have applied themselves to this problem, its solution, such as that at last suggested of an equal division of all possessions, has not as yet been found amenable; and it seems as if the State's disposal of the apparently so simple idea of Property had driven a beam into the body of mankind that dooms it to a lingering death of agony. Clever though be the many thoughts expressed by mouth or pen about the invention of money and its enormous value as a civiliser, against such praises should be set the curse to which it has always been doomed in song and legend. If gold here figures as the demon strangling manhood's innocence, our greatest poet shews at last the goblin's game of paper money. The Nibelung's fateful ring become a pocket-book, might well complete the eerie picture of the spectral world-controller. By the advocates of our Progressive Civilisation this rulership is indeed regarded as a spiritual, nay, a moral power; for vanished Faith is now replaced by "Credit," that fiction of our mutual honesty kept upright by the most elaborate safeguards against loss and trickery. What comes to pass beneath the benedictions of this Credit we now are witnessing, and seem inclined to lay all blame upon the Jews. They certainly are virtuosi in an art which we but bungle: only, the coinage of money out of nil was invented by our Civilisation itself; or if the Jews are blamable for that, it is because our entire civilisation is a barbaro-judaic medley, in nowise a Christian creation. This possibility, of always drawing from the pristine fount of our own nature, that makes us feel ourselves no more a race, no mere variety of man, but one of Manhood's primal branches, — 'tis this that ever has bestowed on us great men and spiritual heroes, as to whom we have no need to trouble whether fashioners of foreign fatherless civilisations are able to understand and prize them; whilst we again, inspired by the deeds and gifts of our forefathers, and gazing with unclouded eye, are able to rightly estimate those foreigners, and value them according to the spirit of pure Humanity indwelling in their work. What "Conservatives," "Liberals" and "Conservative-liberals," and finally "Democrats," "Socialists," or even "Social-democrats" etc., have lately uttered on the Jewish Question, must seem to us a trifle foolish; for none of these parties would think of testing that "Know thyself" upon themselves, not even the most indefinite and therefore the only one that styles itself in German, the "Progress"-party. There we see nothing but a clash of interests, whose object is common to all the disputants, common and ignoble: plainly the side most strongly organised, i.e. the most unscrupulous, will bear away the prize. With all our comprehensive State- and National-Economy, it would seem that we are victims to a dream now flattering, now terrifying, and finally asphyxiating: all are panting to awake therefrom; but it is the dream's peculiarity that, so long as it enmeshes us, we take it for real life, and fight against our wakening as though we fought with death. At last one crowning horror gives the tortured wretch the needful strength: he wakes, and what he held most real was but a figment of the dæmon of distraught mankind. We who belong to none of all those parties, but seek our welfare solely in man's wakening to his simple hallowed dignity; we who are excluded from these parties as useless persons, and yet are sympathetically troubled for them, — we can only stand and watch the spasms of the dreamer, since no cry of ours can pierce to him. So let us save and tend and brace our best of forces, to bear a noble cordial to the sleeper when he wakes, as of himself he must at last. This is Alberich's dream come true — Nibelheim, world dominion, activity, work, everywhere the oppressive feeling of steam and fog. Music has taken a bad turn; these young people have no idea how to write a melody, they just give us shavings, which they dress up to look like a lion's mane and shake at us... It's as if they avoid melodies, for fear of having perhaps stolen them from someone else. What a wonderful work Wagner has done for humanity in translating the toil of life into the readable script of music! For those who seek the tale of other worlds his magic is silent; but earth-travail under his wand becomes instinct with rhythmic song to an accompaniment of the elements, and the blare and crash of the bottomless pit itself. Heartless sterility, obliteration of all melody, all tonal charm, all music. This revelling in the destruction of all tonal essence, raging satanic fury in the orchestra, this demoniacal, lewd caterwauling, scandal-mongering, gun-toting music, with an orchestral accompaniment slapping you in the face. Hence, the secret fascination that makes it the darling of feeble-minded royalty, of the court monkeys covered with reptilian slime, and of the blasé hysterical female court parasites who need this galvanic stimulation by massive instrumental treatment to throw their pleasure-weary frog-legs into violent convulsion. The diabolical din of this pig-headed man, stuffed with brass and sawdust, inflated, in an insanely destructive self-aggrandizement, by Mephistopheles' mephitic and most venomous hellish miasma, into Beelzebub's Court Composer and General Director of Hell's Music — Wagner! Edgar Wilson Nye, as quoted in Twain's Autobiography (published in 1924). 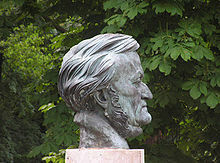 The late Bill Nye once said, 'I been told that Wagner's music is better than it sounds. Monsieur Wagner a de beaux moments, mais de mauvais quart d'heures. Gioachino Rossini, Letter to Emile Naumann, April 1867, quoted in E Naumann Italienische Tondichter (1883) vol. 4, p. 5. Translation from The Riverside Dictionary of Biography (2005), p. 689. After the last notes of Götterdämmerung I felt as though I had been let out of prison.